Punching Nazis: what would Indiana Jones do? While millions of people joined a worldwide women’s march to protest the inauguration of US President Donald Trump, and a smaller number gathered to celebrate it, parts of the internet were debating the vital question: is it OK to punch Nazis? The debate was sparked when Richard Spencer – the antagonistic president of the National Policy Institute, a white nationalist think tank – was punched in the face by a masked assailant during a television interview. Captured by the cameras of the Australian Broadcasting Corporation, footage of the punch quickly spread across social media. By the end of the weekend, a number of dedicated hashtags such as #punchmorenazis and #punchyourlocalnazi had sprung up. These hashtags countered the recent rebranding of white supremacy as the “alt-right”. Instead, users drew historical comparisons between contemporary events in the US and those of 1930s Germany. Social media users also remixed the footage of the Spencer punch to music, from Disney’s Frozen, Rage Against the Machine and the Indiana Jones theme tune. The choice of Indiana Jones was not coincidental. In fact, it tapped into the growing symbolic value of the film franchise to many of those who resist the world’s political slide to the extreme right. In the films, archaeologist Professor Indiana Jones is a staunch anti-Nazi. This is perhaps best illustrated by his exploits in Raiders of the Lost Ark (1981) and the moment in Indiana Jones and the Last Crusade (1989) when Jones remarks, “Nazis – I hate these guys”. So it is not surprising that after Spencer was punched, Indy returned to our screens, albeit on mobile devices rather than in movie theatres. He appeared in memes featuring Nazi fight scenes from both these movies and in one tweet from comic book writer Gerry Duggan, alongside a still of the Spencer punch and an image of Captain America punching Hitler, dating to the superhero’s first appearance in 1941. Significant research has been carried out on the geopolitical symbolism of Captain America but Indy has escaped similar degrees of scrutiny. A cursory attempt at such an analysis reveals how Indiana Jones, partly through his new associations with Captain America, personifies certain ideas of American patriotism. This is interesting given that one of the earliest symbolic uses of Indiana Jones can be attributed to a Berlin-based anti-fascist group, whose members would surely find patriotism’s close relationship with nationalism a little problematic. A sticker that appeared on street corners throughout the German capital between roughly 2008 and 2013, and which is now archived in the Street Art Graphics Collection at St. Lawrence University, shows Indy, in his famous fedora, punching a large bare-chested, skin-headed Nazi. Its slogan implores: “Do It Like Indiana Jones”. Professor Susan Aronstein has described the Nazism depicted in the original Indiana Jones trilogy as an “interchangeable force of darkness”. Casting the Nazis as the bad guys tapped into easily recognisable categories of good and evil helped the films re-establish America as a land of liberty after the Vietnam War. Since then, Indy’s patriotism has found new targets that complicate his symbolic value for the political left. In the 2008 reboot, Indiana Jones and the Kingdom of the Crystal Skull, the Soviet Union stepped in to become his main adversary. Besides being widely criticised for jumping the shark, or more specifically, nuking the fridge, the film drew the ire of the Russian Communist party, which called for its boycott. This reaction was reminiscent of the Indian film certification board’s response to Indiana Jones and the Temple of Doom (1984). They temporarily banned the movie for its negative depiction of Hinduism. Until recently, few leapt to the defence of Indy’s Nazi enemies but this might soon change, given the alt-right’s recent negative reaction to Star Wars. Ultimately, the binary logic of good versus evil has masked some of the more problematic aspects of Indy’s escapades, not least their neo-colonialism and sexism. Real archaeologists have highlighted these deficiencies but for the most part, Indiana Jones is still generally held in high regard by scholars who are keen to attract public interest. But where does the rallying call to punch more Nazis leave an academic discipline that openly acknowledges the character’s huge influence on its public perception and student enrollment numbers? Watching the Indiana Jones led me to study archaeology at university and I still remember learning about the Nazi regime’s abuse of the discipline to promote their racist ideologies. Thus I partly agree with those who are glad to see archaeology channelled through popular fictional characters like Jones to influence opinion against far-right extremism. And yet I cannot shake the nagging feeling that using Indy in this way might also come to reinforce growing anti-intellectualism and contribute to the deepening divides between academics and those segments of the public that sympathise with or are vulnerable to far-right ideologies. These cleavages recently became evident with the launch of the Professor Watchlist, which encourages students to “expose and document college professors who discriminate against conservative students and advance leftist propaganda in the classroom”. The initiative attracted criticism on social media and opponents responded by trolling the website with fake reports relating to fictional academics including, yes you’ve guessed it, Professor Indiana Jones. 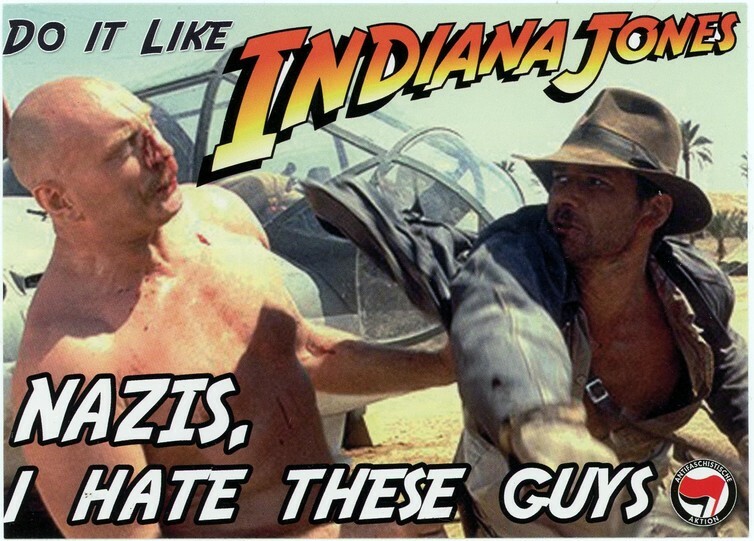 So is it OK to use Indiana Jones as an excuse to support punching white supremacists? Certain moments may allow only a small number of reasonable responses, some of which may involve the use of violence. However, it is worrying when popular icons are flattened and their advocates or fans filtered into bubbles on the right and left in ways that close down the opportunity to exchange opinions for the better. We rarely see Professor’s Jones intellectual skills in action but perhaps it would be productive to encourage him to land heavier punches through recourse to knowledge, rather than his fists. Ideally, those drawn to the field of archaeology by Indy’s most recent outings would learn to defeat the rise of the right through the use of intellect rather than violence. Perhaps they will even manage it by the time the fifth Indiana Jones film is released in the summer of 2019. Is CNN a credible news source anymore?